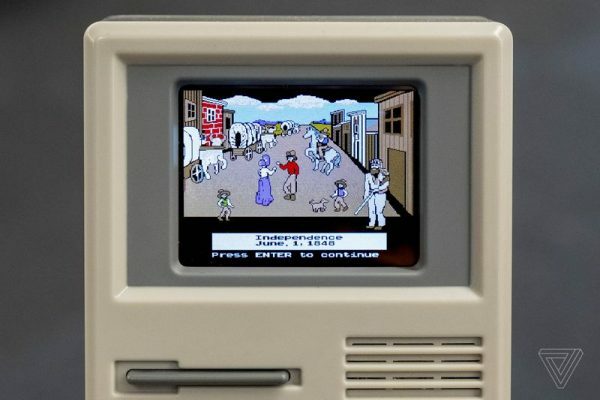 The Oregon Trail Handheld Game « Adafruit Industries – Makers, hackers, artists, designers and engineers! To the best of my recollection, I haven’t played The Oregon Trail since leaving elementary school. I haven’t tried any ROMs, online versions, or the recent remake inside of Minecraft, which looks fun for a new generation of gamers. Also, my memory is nowhere near good enough to know precisely which Oregon Trail this really is; the consensus seems to be that it’s closer to the MS-DOS version than the Apple II, since you’re able to freely walk around while hunting. But as I pressed the big, loose-feeling buttons on this chunky plastic handheld and made mission-critical decisions, I felt the familiar pressures of looking after everyone in my group and the helplessness of seeing a random pop-up alert that someone had broken a limb or come down with cholera. Just kidding. This is The Oregon Trail we’re talking about. If someone making the trek with you doesn’t die of dysentery, you’re not getting the full experience. I do still get unreasonably sad when oxen die; that hasn’t changed. And my girlfriend wasn’t thrilled when her character unexpectedly croaked after a single bout of exhaustion. Some folks just aren’t cut out for this journey.